Parvaneha is the new OMID program for girls with extreme traumatic pasts, who need individualized therapeutic support and help with adapting and integrating with others again. These are girls who have been so damaged by abuse and neglect that they have difficulty functioning in society, and are unable to enroll in the main program when they arrive at OMID. The name, meaning butterflies, was chosen by the girls in this part of our program. They live and work in a safe and relaxing place with one room for classes like computing and arts and a main communal living room (pictured). Here they learn to cook and serve food for each other. They are nurtured to learn empathy, collaboration and team work. Two specialist employees work with them on computing an art classes, that are run separately from the main program at OMID. They will also be going on their own field trips. After anywhere between six to twelve months, depending on their readiness, they will be integrated into the main OMID program. 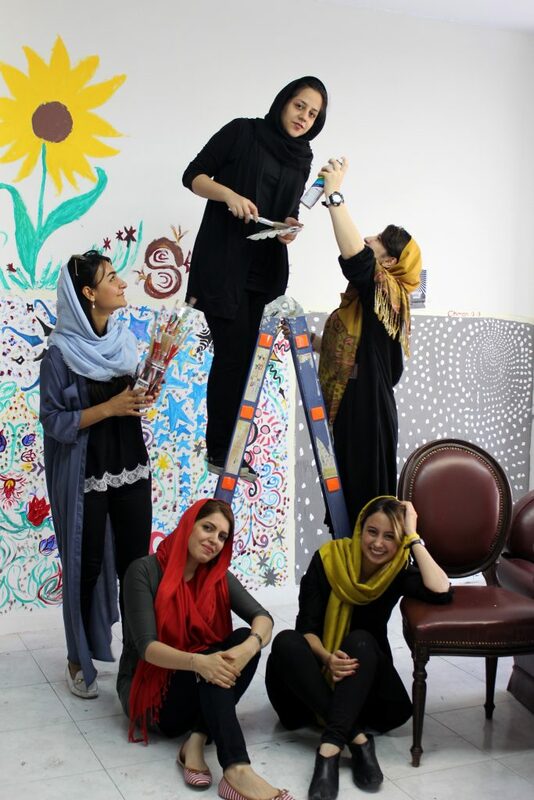 A former OMID Angel, Sevil Zadeh from the UK paid OMID a quick visit before leaving Iran and she took the above a photo with the Parvaneha girls as they were getting ready to continue their artworks and murals on the walls of their communal room. From left to right: Sevil Zadeh, Raha Miri & Chiman Sharifi (on the ladder). Sitting down are from left to right Fatemeh Eslami and Diba Ferdowsi the group co-leads. Click here for more information about our holistic program and click here to find out how you can help.